West Virginia is headed in the right direction and there is much to celebrate. Our unemployment rate is low, job growth is high, we anticipate a budget surplus for the first time in years and our workforce participation rate is improving. And this is just the beginning. Our teachers received a historic raise. We are seeing an incredible amount of infrastructure development. Road and bridge construction is underway at an unprecedented rate and multiple interstate natural gas pipelines are being developed, which will help grow our state’s gas industry and the jobs it provides. Gov. Jim Justice is leading the charge with President Donald Trump to assure mining and power plant jobs are retained in West Virginia. The Trump-Justice Plan will ensure the safety of America’s power grid while helping grow our economy here at home. CHARLESTON, W.Va. – The West Virginia Coal Association had the opportunity to join Gov. Jim Justice in publicly thanking President Donald Trump for taking historic action to protect the American coal industry. 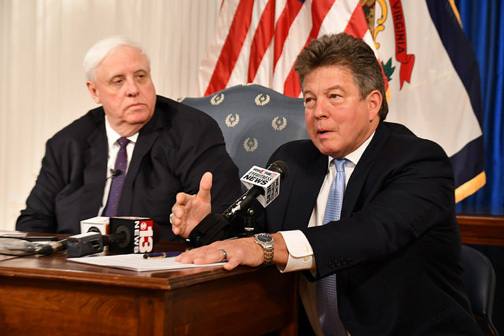 During a press conference June 7 at the West Virginia State Capitol, Justice and WVCA Senior Vice President Chris Hamilton explained to news media the importance of Trump’s June 1 directive to U.S. Energy Secretary Rick Perry. Taking inspiration from the Justice’s energy plan and the governor’s public commitment to rebuilding West Virginia’s coal industry, Trump ordered Secretary Perry on June 1 to take immediate steps to protect the viability of American coal-fired and nuclear-fired power plants. Hamilton said the Trump-Justice plan calls for federal incentives to prevent the closure of additional plants. Any additional closures would weaken the nation’s electrical grid even further and risk continued reliable delivery of electric power to American homes and businesses.